Welcome to the KoS Forum. *New Updates! We have a proboards forum! Join if you want to have twice the fun! (actually, Ellen was just bored and wanted something to do. Try not to judge her) http://kingsofsybarite.proboards.com/index.cgi *Roleplay has been added! *New banner has been added! *Navigation bar and other buttons have been added! *Guests now can post in Guest Board! 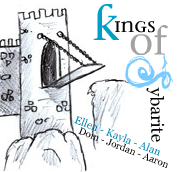 Kings of Sybarite, 2010 Copyright Protected. If you can read this, I LOVE YOU. -Kayla. If you can't, I'll send Brick to eat you. ~ Alanator. If you don't want to, I'll make Allen stalk you. -Kayla. And if you do, Brick is still watching you. ~ Alanator. But, most importantly, if you are not a pirate, I'll *facepalm* you :D -Kayla. And if you are, Brick will "take care" of you. ;D ~ Alanator. That's code for putting his motorcycle in your parking garage. -Kayla. Read these, or... uh, just read them. Mmkay? Good. Check out the latest updates to the KOS forum. If you're new, THOU SHALT POST HERE. Post anything to do with media here! For RP based on a show or existing topic, RP here. Guests can post their thoughts on KoS. DO NOT post spam or ads.